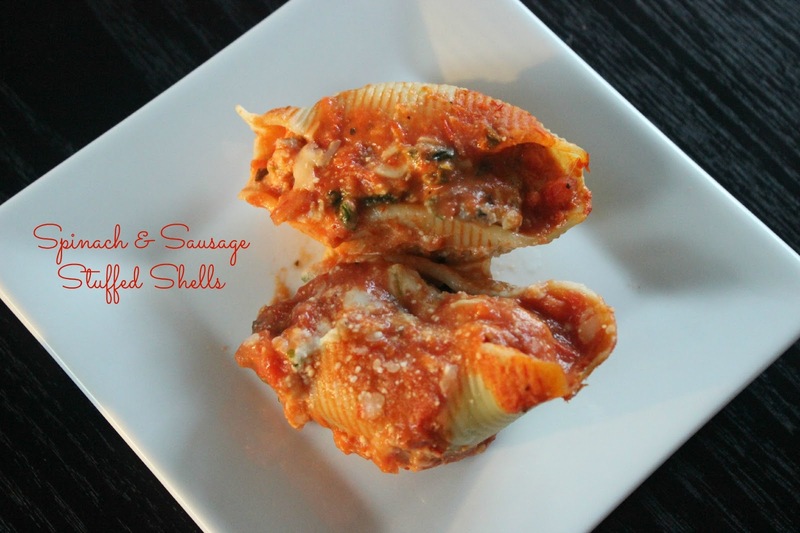 It's been awhile since I've posted a recipe so today I thought I would my share my simple stuffed shells recipe! I've always grown up around Italian food and I have come to realize that most Italian dishes contain similar ingredients, only prepared differently. 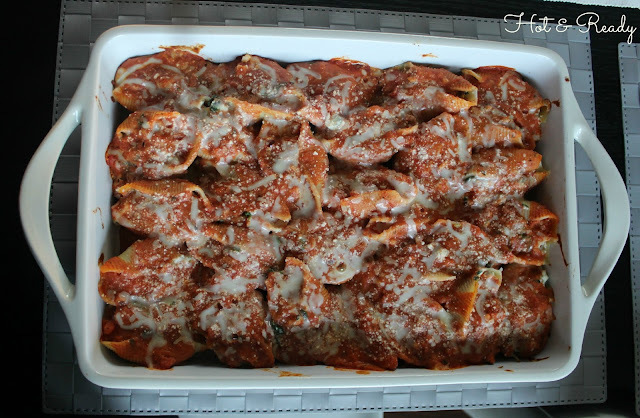 So for my perfect stuffed shells I don't really follow a recipe, I just go with the flow of cooking Italian and it usually works! Like I have mentioned I love semi-homemade cooking with the kiddos so I will not be making homemade sauce in this recipe either (I'm such a rebel)...ha! First preheat your oven to 350°. Then drizzle olive oil in a pan and once hot, sauté the onions and garlic until tender. After, add in the Italian sausage and break it up with a spatula until it is in crumbles. While doing this go ahead and season it with the garlic powder, Italian seasoning, salt, and pepper to your liking. Once the meat has browned, drain the excess drippings and put it aside to cool. Next you can boil the shells by following the instructions on the box. I always remove them from the water a couple of minutes early so they are al dente and easier to work with so they don't break. Ten minutes seems to be a magic number in my book. Once done, drain and put aside as well. 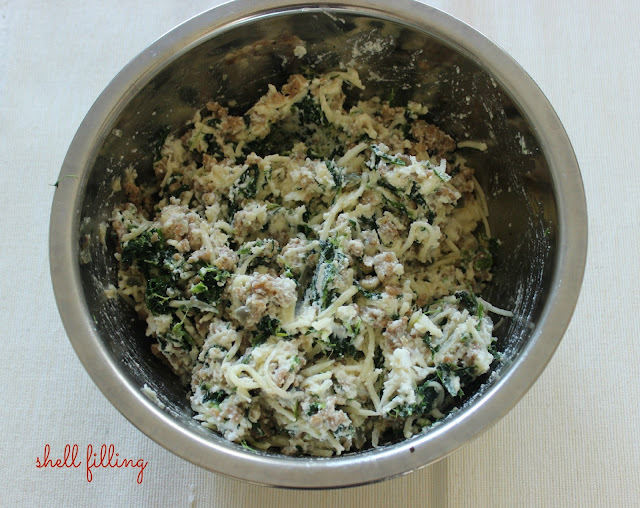 Then grab a medium sized bowl and combine the ricotta cheese, spinach, egg, 1.5 cups of shredded mozzarella cheese, and the crumbled sausage. Gently fold the mixture until everything is thoroughly combined. After, you can grab a 9x13 inch lasagna pan and lightly spray the bottom with cooking spray. You can also substitute a little sauce to grease the bottom if you'd like. Next begin stuffing the shells with the mixture. How much you stuff them is really a personal preference, I put about two tablespoons of the mixture in or until the shell is full. Line them faced up until the pan is full or you run out of shells. I can usually fit all of the filled shells in so I don't have any leftover. Once that step is done I spread spaghetti sauce all over the shells. It's important to completely cover any parts of the shell with sauce so you don't have any pieces that get to crispy while baking. 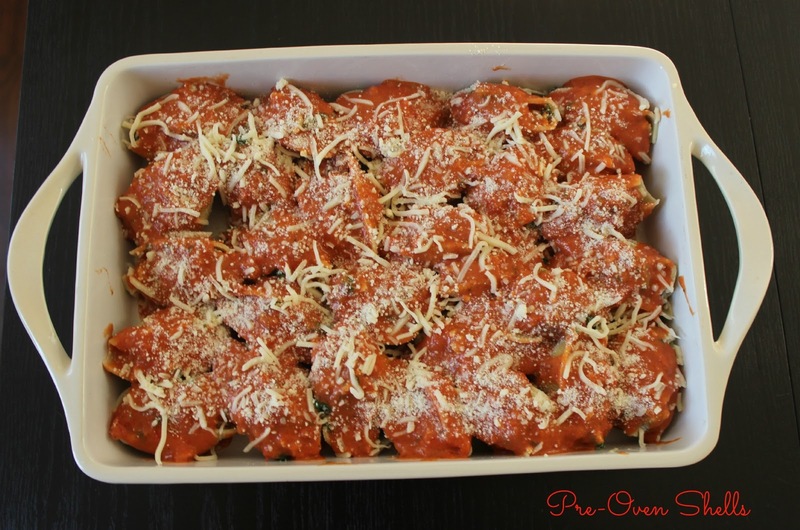 Next I sprinkle the remaining 1/2 cup of mozzarella cheese and parmesean cheese on top of the shells, cover with foil, and bake for 45 minutes in the oven. 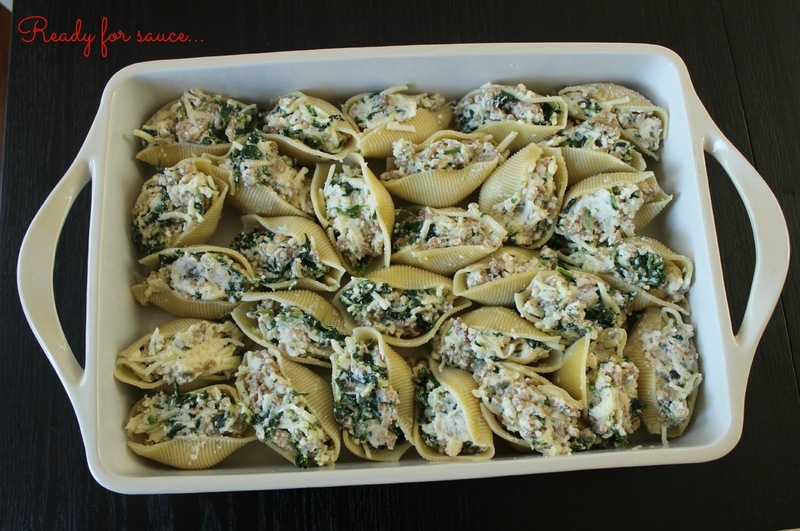 You can serve the shells with extra sauce and a yummy piece of garlic bread to top off the goodness! This is a great recipe to play around with and alternate ingredients or even make ahead and freeze. It should make anywhere from 25-30 shells so I hope you're hungry!